There is much variation in the colour of bare-nosed wombats. Glossy black, dark grey, silver-grey, chocolate brown, grey-brown, sandy and cream-coloured wombats are all found. (Plates 4 and 7). A small colony of ash-white wombats, with dark eyes and pale yellow markings on the face, is found on Wilson's Promontory in southern Victoria (Plate 5). Albino wombats also have occasionally been reported. It is not uncommon for black wombats, in particular, to have one or more patches of white fur and, occasionally, white claws, but most wombats are uniformly coloured. Frequently a wombat will appear to have patches of fur that are lighter in colour than the rest of the coat, giving rise to descriptions such as 'moth-eaten' or even 'spotted'. When new fur grows over a healed wound, it is usually much lighter in colour than the rest of the coat, and it is this new hair which gives the wombat a temporarily patchy appearance. A wombat's coat can also be coloured by the soil in its locality, particularly that in the burrows. Clay, for instance, can stain the fur red (Plate 6) and dark, loamy soil colours it black. Several different colours of bare-nosed wombats may be found in the same area, but one colour usually predominates. In most parts of the eastern ranges in Victoria, the principal colour is grizzled brown, while in some coastal areas and in Tasmania, the majority of the wombats are grey. The hairs of a wombat's coat are a mixture of several colours, but the overall colour of an individual depends on the amount of each colour in the blend. A brown wombat, for instance, has intermingled black, brown and gold hairs, and some of these hairs have white bands, but the dominant colour is brown. The texture of the coat of the bare-nosed wombat is generally coarse; the long guard hairs are about 200 microns in diameter, which is nearly twice the diameter of the coarsest human hair. 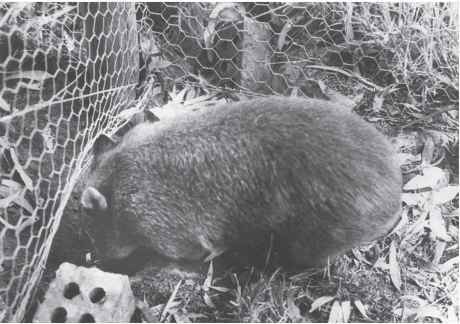 The hairs on the wombat's rump are particularly coarse and are better described as bristles. These are only about one or two centimetres long, in contrast to the hairs on the flanks and shoulders, which are up to six centimetres long. Northern hairy-nosed wombats have soft fur, about 100 microns wide. The usual colour is grey-brown, but some wombats have grey fur mottled with black, dark brown or a sandy brown colour. Most of the hairs are about 3.5 centimetres long. The southerns also have silky fur, about 125 microns wide. It is light to dark grey, darkest above the forequarters and slightly longer than the northerns - about 4.5 centimetres. All wombats have a very thick skin, especially on the back and rump. The layer covering the strong, broad pelvis is about one centimetre thick, and it gives the wombat considerable protection against the bites of enemies such as dogs and dingoes. If a wombat is chased into a burrow, it will wedge its strong back against the roof of the burrow to block it; there have been a number of instances where a wombat is known to have crushed a dog's skull against the roof of a burrow, and others are probably killed by suffocation as they are squeezed against the burrow walls.